From the New York Times bestselling author of Loving Frank comes a much-anticipated second novel, which tells the improbable love story of Scottish writer Robert Louis Stevenson and his tempestuous American wife, Fanny. Nancy Horan’s first novel, Loving Frank, chronicles a little-known chapter in the life of American architect Frank Lloyd Wright. It was translated into sixteen languages, remained on the New York Times bestseller list for more than a year, and in 2009 was awarded the James Fenimore Cooper Prize for Best Historical Fiction, presented by the Society of American Historians. 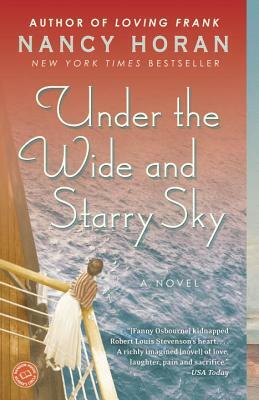 Under the Wide and Starry Sky explores the shared journey of Robert Louis Stevenson and his spirited American wife, Fanny, in a sweeping adventure that unfolds over eighteen years and three continents. Nancy Horan has two sons, and lives with her husband on an island in Puget Sound.